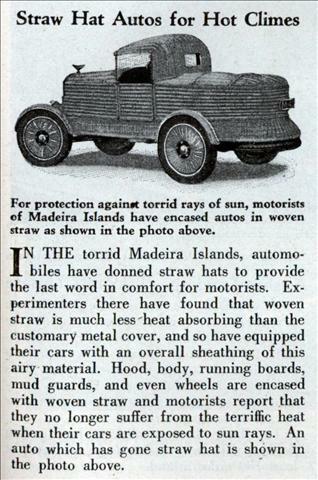 IN THE torrid Madeira Islands, automobiles have donned straw hats to provide the last word in comfort for motorists. Experimenters there have found that woven straw is much less heat absorbing than the customary metal cover, and so have equipped their cars with an overall sheathing of this airy material. Hood, body, running boards, mud guards, and even wheels are encased with woven straw and motorists report that they no longer suffer from the terriffic heat when their cars are exposed to sun rays. An auto which has gone straw hat is shown in the photo above. 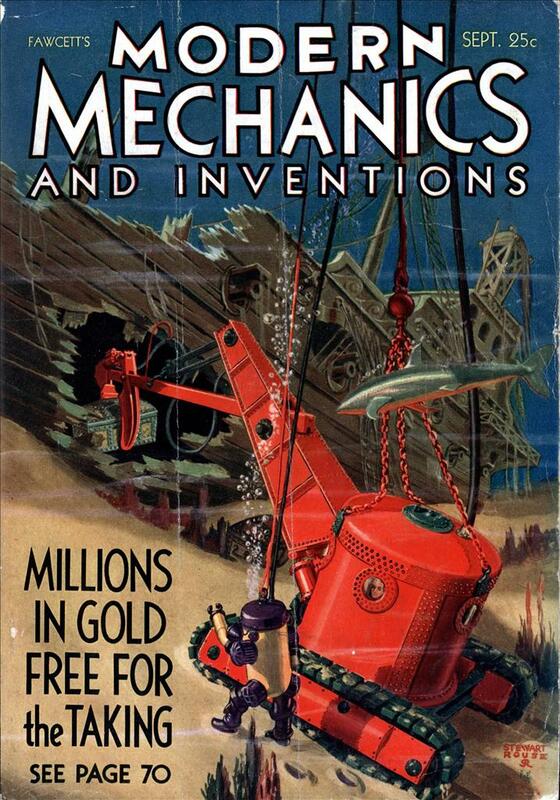 Many of the early steam locomotives used by the British had boilers clad in wood, for the insulating qualities. Don’t forget the woodie station wagons that are so popular with collectors too. Hot weather, gasoline, a running engine, and straw. What could go wrong? You could always douse it with a bottle of Madeira, if things go wrong…. Y’know, I can understand the roof and the main bodywork – shielding it from the sun would help the heat. But the fenders and the wheels? This seems like another of the “we got a picture, make up a story” articles. What about the one made sticks and the brick one? Puts me in mind of the Fiat Jolly from a number of years later. A neighbor in California in about 1968 had a basket car – I believe it was based on an Izetta, though I may be misremembering – perhaps it was an Innocenti (Mini) platform.